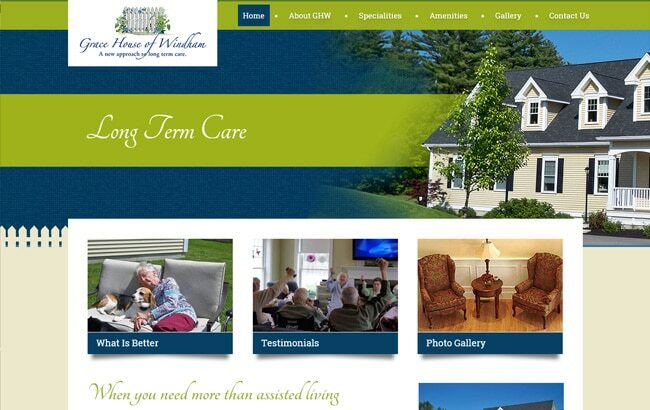 Grace House Windham is an upscale assisted living facility in Windham, New Hampshire that is designed to look and feel like a real home for it's guests. Grace House provides services in medication management, exercises classes, housekeeping and great extras like a hair salon and pet therapy. The main goal was to develop a more modern site, one that family members connect with immediately when researching alternatives for their loved ones. GoingClear helped by designing a fresh new look for the Grace House of Windham website that is as colorful, friendly and engaging as caregivers of the facility. The site features large text, high-quality photos, easy navigation, as well as photo and video galleries so visitors can feel comfortable and confident with their decision.